Biological sensory systems react to changes in their surroundings. They are characterized by fast response and slow adaptation to varying environmental cues. Insofar as sensory adaptive systems map environmental changes to changes of their internal degrees of freedom, they can be regarded as computational devices manipulating information. Landauer established that information is ultimately physical, and its manipulation subject to the entropic and energetic bounds of thermodynamics. Thus the fundamental costs of biological sensory adaptation can be elucidated by tracking how the information the system has about its environment is altered. 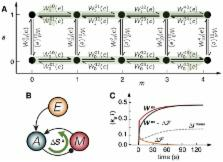 These bounds are particularly relevant for small organisms, which unlike everyday computers, operate at very low energies. In this paper, we establish a general framework for the thermodynamics of information processing in sensing. With it, we quantify how during sensory adaptation information about the past is erased, while information about the present is gathered. This process produces entropy larger than the amount of old information erased and has an energetic cost bounded by the amount of new information written to memory. We apply these principles to the E. coli's chemotaxis pathway during binary ligand concentration changes. In this regime, we quantify the amount of information stored by each methyl group and show that receptors consume energy in the range of the information-theoretic minimum. Our work provides a basis for further inquiries into more complex phenomena, such as gradient sensing and frequency response. The ability to process information is a ubiquitous feature of living organisms. Indeed, in order to survive, every living being, from the smallest bacterium to the biggest mammal, has to gather and process information about its surrounding environment. In the same way as our everyday computers need power to function, biological sensors need energy in order to gather and process this sensory information. How much energy do living organisms have to spend in order to get information about their environment? In this paper, we show that the minimum energy required for a biological sensor to detect a change in some environmental signal is proportional to the amount of information processed during that event. In order to know how far a real biological sensor operates from this minimum, we apply our predictions to chemo-sensing in the bacterium Escherichia Coli and find that the theoretical minimum corresponds to a sizable portion of the energy spent by the bacterium. The somatosensory system decodes a wide range of tactile stimuli and thus endows us with a remarkable capacity for object recognition, texture discrimination, sensory-motor feedback and social exchange. The first step leading to perception of innocuous touch is activation of cutaneous sensory neurons called low-threshold mechanoreceptors (LTMRs). Here, we review the properties and functions of LTMRs, emphasizing the unique tuning properties of LTMR subtypes and the organizational logic of their peripheral and central axonal projections. We discuss the spinal cord neurophysiological representation of complex mechanical forces acting upon the skin and current views of how tactile information is processed and conveyed from the spinal cord to the brain. An integrative model in which ensembles of impulses arising from physiologically distinct LTMRs are integrated and processed in somatotopically aligned mechanosensory columns of the spinal cord dorsal horn underlies the nervous system's enormous capacity for perceiving the richness of the tactile world. Copyright © 2013 Elsevier Inc. All rights reserved. A systems-level analysis of perfect adaptation in yeast osmoregulation. Negative feedback can serve many different cellular functions, including noise reduction in transcriptional networks and the creation of circadian oscillations. However, only one special type of negative feedback ("integral feedback") ensures perfect adaptation, where steady-state output is independent of steady-state input. Here we quantitatively measure single-cell dynamics in the Saccharomyces cerevisiae hyperosmotic shock network, which regulates membrane turgor pressure. Importantly, we find that the nuclear enrichment of the MAP kinase Hog1 perfectly adapts to changes in external osmolarity, a feature robust to signaling fidelity and operating with very low noise. By monitoring multiple system quantities (e.g., cell volume, Hog1, glycerol) and using varied input waveforms (e.g., steps and ramps), we assess in a minimally invasive manner the network location of the mechanism responsible for perfect adaptation. We conclude that the system contains only one effective integrating mechanism, which requires Hog1 kinase activity and regulates glycerol synthesis but not leakage. Chemosensing in Escherichia coli: two regimes of two-state receptors. The chemotaxis network in Escherichia coli is remarkable for its sensitivity to small relative changes in the concentrations of multiple chemical signals. We present a model for signal integration by mixed clusters of interacting two-state chemoreceptors. Our model results compare favorably to the results obtained by Sourjik and Berg with in vivo fluorescence resonance energy transfer. Importantly, we identify two distinct regimes of behavior, depending on the relative energies of the two states of the receptors. In regime I, coupling of receptors leads to high sensitivity, while in regime II, coupling of receptors leads to high cooperativity, i.e., high Hill coefficient. For homogeneous receptors, we predict an observable transition between regime I and regime II with increasing receptor methylation or amidation. Conceived and designed the experiments: PS LG CFL JMH. Performed the experiments: PS LG CFL JMH. Analyzed the data: PS LG CFL JMH. Contributed reagents/materials/analysis tools: PS LG CFL JMH. Wrote the paper: PS LG CFL JMH. This work was partially supported by a Max Planck society ( www.mpg.de) scholarship to PS and LG, by grant ENFASIS (Spanish government: www.idi.mineco.gob.es/) to LG and JMH, and by Army Research Office ( http://www.arl.army.mil) MURI grant W911NF-11-1-0268 to JMH. The funders had no role in the study design, data collection and analysis, decision to publish, or preparation of the manuscript. Thermodynamic stability of bacteriorhodopsin mutants measured relative to the bacterioopsin unfolded state.